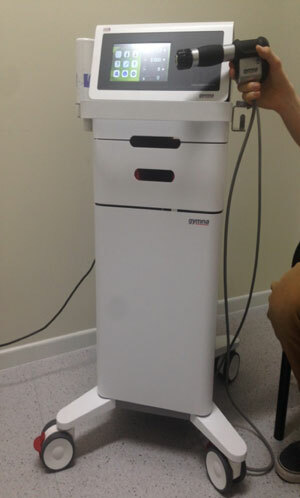 We have been treating our patients with shockwave therapy for some time now, and very successfully too. Please contact us. We will be happy to give you all the information that you need. The healing process is accelerated by stimulating the self-healing properties of the body. Improves metabolism and blood circulation. Decreased pain – improved mobility. Radial ShockWave Therapy (R-SWT) is a modern and very effective method of treatment. The effect of radial shockwave therapy can often already be noticed after as few as 4 sessions. The healing process is accelerated by stimulating the self-healing properties of the body. They improve the metabolism and the blood circulation. Damaged tissue recovers and heals itself. This will cause the pain to decrease and mobility to improve. The therapist determines the location of the pain by searching for painful points. These can also be localised using the hand piece or ultrasound. Gel is applied to the treatment zone. This improves the contact between the skin and the hand piece to allow the shockwaves to penetrate the body properly. The hand piece is placed on the pain zone and shockwaves are released. In general, this is painless but sometimes it could be perceived as ‘unpleasant’. In a number of cases, the therapist will use a different treatment head, the D-ACTOR. This combination of shockwaves and vibrations is also used for muscular disorders. A treatment session lasts between 5 and 10 minutes, depending on the condition to be treated. In general, 6 to 8 treatment sessions will be needed at intervals of one week.